All efforts to introduce safeguards in the form of reporting requirements, sunset clauses and public interest immunity were rejected by both the Coalition and Labor. An amendment secured by the Palmer United Party to actually increase the penalty for identifying an intelligence officer from one to ten years' imprisonment. Only the Greens, Leyonhjelm, John Madigan and Xenophon refused to support the amended laws. Scott Ludlam fought hard to keep the debate going, and moved a series of amendments that would have protected journalists and whistleblowers, wind back some of the broad new computer warrant powers and increase oversight of ASIO. The threat of terrorism to Australia has been greatly exaggerated. The idea that IS can attack Australia from its bases in Syria and Iraq is a fantasy and a deliberate scare mongering by the government aided and abetted by the national security media. This evokes an imagined fear, which is then vindicated by an actual event--eg., the shooting death of an 18-year-old so called "terrorism suspect" (Abdul Numan Haider) and double-stabbing of police officers in Melbourne. 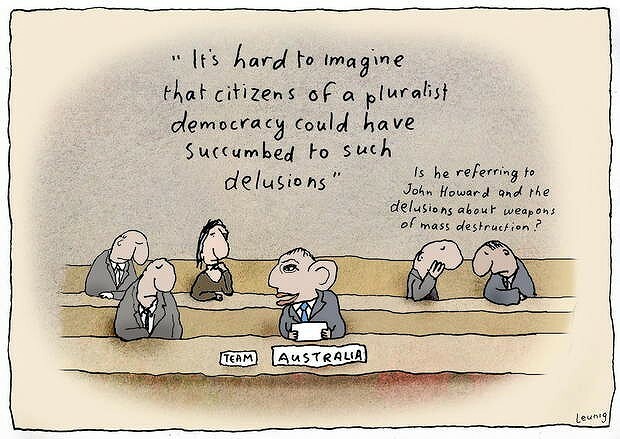 The Abbott government then plays the counter-terrorism card hard to maximise their chances of re-election. The overwhelming police response so far is aimed at members of Australia’s Middle Eastern, Muslim minority and that the white supremacist, bigoted racist wallies who want to burn mosques and attack young Muslim women in the street, are being left to foment their own special kind of trouble. Giving more and stronger powers – of arrest, detention, investigation and interrogation of suspects – to the police and ASIO represent steps towards an authoritarian government. Blood is racing through the tabloid's veins. It is white feathers for dissenters according to the tabloids. They are eager to bomb IS in Iraq and Syria and to hell withe the consequences. They have war fever. Tio hell with freedom. It's national security that matters. The return to war will reinforce the politics of fear – which is the grimmest legacy of the Howard era in Australia. Isis as a “threat to Australia’s national security”. Its existence is threatened by jihadism. We have the enemy in our sights. The 3rd Iraq war allows Abbott strut on the world stage with his "bring it on" machismo. Some of our politicians have been engaged in a deliberate campaign of blatant Islamophobia, and have been for some time. We have a culture that makes it ok to attack the Muslim community, over and over again. And a media that makes such attacks ok, through either tacit or overt support. The consequence of the Abbott government invoking a cloak of secrecy under the claim of “national security” is that it invites suspicion that some Ministers and members of the surveillance and security forces will exercise their power inappropriately. I can't find anything to quarrel with as to this thread starter, so obviously it is how I read what is going down also, which has little to do with "terrorism" and much to do with the gelding of a previously healthy civil society. That it is happening elsewhere in the West is not an excuse and not coincidental, but should raise alarm bells for thinking people. I'd just add a couple of things: one, the obsessive and risable coverage by media, most of all from the prostituted, compromised and zombied Stepford ghost of a once worthwhile ABC. Two, the fact of another pitiful capitulation by Labor, again AWOL when the chips have been down and serious debate called for, as to a fundamental existential threat to democracy. I am ashamed to have ever felt they were "my" party.